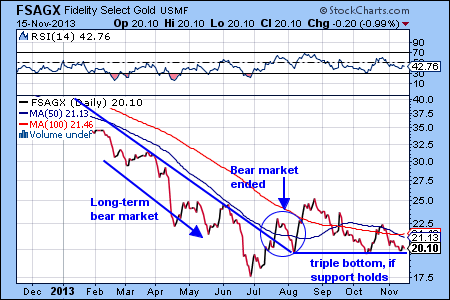 Rising interest rates created a bear market for bonds resulting in most bond mutual funds loosing value in 2013. Unfortunately, there are just not many good choices for income investors. One of the few exceptions is high-yield corporate bonds and one of the best mutual funds available to participate in this trend is the Fidelity Capital and Income Fund (FAGIX). Despite the name, FAGIX is not a growth and income fund, but a high-yield bond fund, based on the Morningstar classification. The 4.32% yield and the 7.01% year-to-date return sets FAGIX apart of most bond funds. We would continue to stay bullish on FAGIX, as long as the trendline (see blue line on chart) and the 50-day moving average holds. 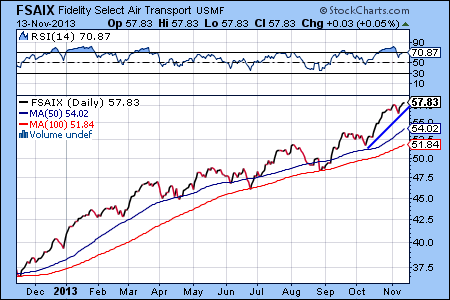 Increased merger activity and decreased fuel prices created a very strong bull market for airline stocks for most of 2013. 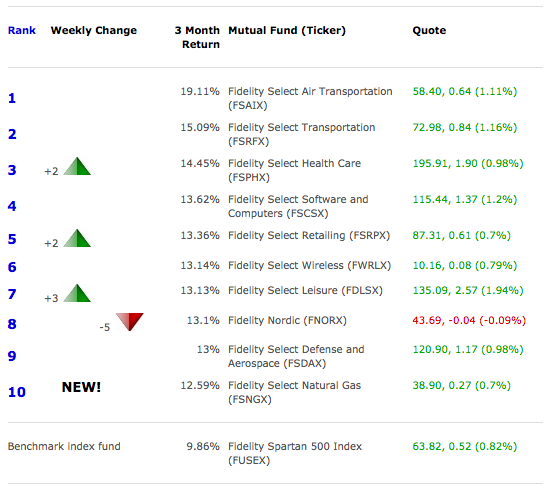 Not surprising that the Fidelity Select Air Transportation Fund (FSAIX) has moved to the top on the FidelitySignal.com momentum ranking. The strong momentum has accelerated since early October and FSAIX has become slightly overbought. This may be a good place to take some profits off the table for the fortunate investors who have invested in this sector early. Stock market indexes closed at all time highs on low volume today. One of the strongest performers is the Fidelity Select Software and Computers Fund (FSCSX, last change: 1.04%). 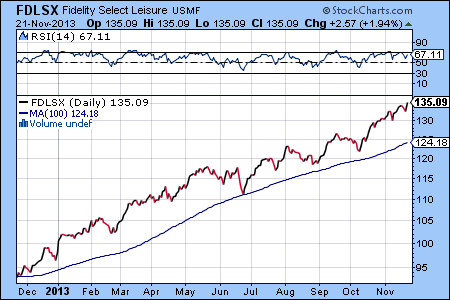 FSCSX has returned 37.15% so far in 2013, handily outperforming the market. 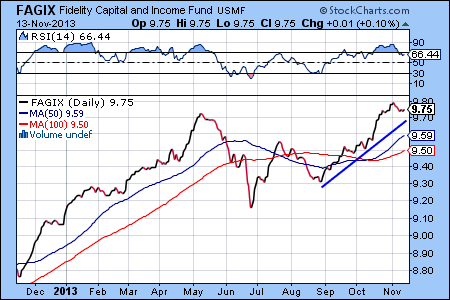 Is it Time to Buy the Fidelity Emerging Market Fund? Emerging market investments have under-performed for most of 2013, but as money starts flowing into Chinese, Indian and Brazilian equities again, the Fidelity Emerging Markets Fund (FEMKX, last change: 1.7%) may be a good choice for investors who are looking to diversify.